← Small Things – yes that’s you too Clarkson. Do you like my snow? I actually am thinking of last years whites outs rather fondly…nostalgia and all that. There’s something satisfying about weather that conforms to our storybook imaginings. Also I’d always rather be too cold than hot, I think this comes from being ‘nicely covered’ as Della with the fine figure at swimming says. Zeph and I romped home triumphant from a very happy craft fair yesterday. I managed to resist spending my profit (except for some irresistible button earrings ) and to keep a lid on Z’s joyous spending (there was a pocket-money toy stall) Some really kind friends and family showed up in support and that was maybe the best thing although the relief of hard cash is also warming my mercenary heart. Actually one of the best things was Zeph, in the apron my resourceful cousin dug out for him, trying out a few trader gestures. He had a really engaging way of pressing the cards with my contact details into people’s hands. I still marvel at the fact he seems to have better social skills than me, how has this happened? Whatever the process I’m deeply grateful. One of us has to be able to ask the price of things. 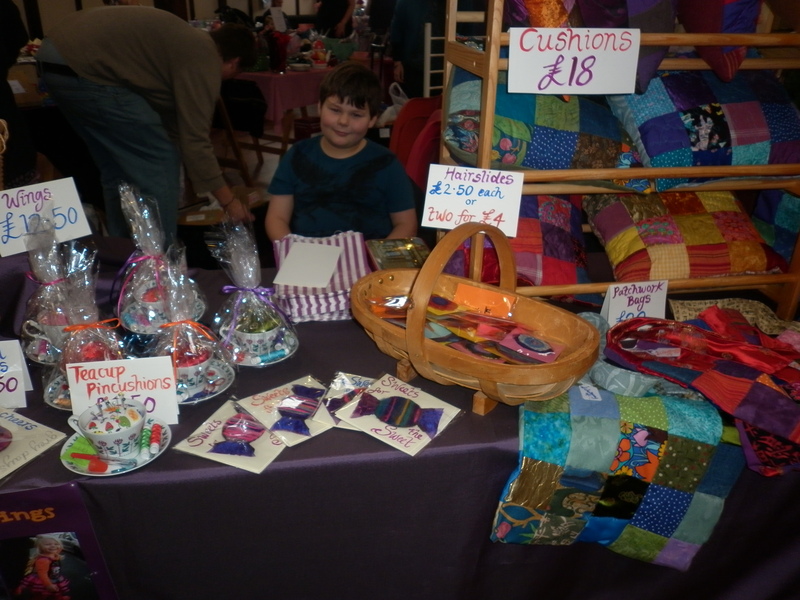 This entry was posted in Uncategorized and tagged blog snow, children, craft, craft fairs, happiness. Bookmark the permalink. Congratulations on your success. The cushions look beautiful. Just seen the patchwork bags. Lovely, I adore patchwork. All my children have far better social skills than me but that is saying nowt as I am totally inept in that department. I just know when I get to Britmums Live my followers on the blog will be deeply disappointed. I can be warm in writing and despite feeling warm just struggle to get that across face-to-face. I want one of those cushions. Actually I want three or four! Let me know if you’re doing a craft fair in Stroud. I wish I had the patience to do things like that. I used to when I was a teenager. I do like your snow – and your amazing crafts. I think it would be fun to spend a day at your house!